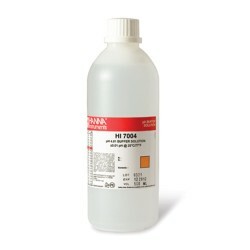 Excellent Choice Hanna's Buffer solutions are made from established formulas and are standardized with a pH meter that is calibrated to NBS/NIST primary standard buffer solutions. The 20 mL sachets are ideal for infrequent calibrations while for heavy-duty applications, you can choose from the popular 230 mL, 1 liter or 1 gallon containers. Now the pH 4 buffers carry lot #, expiry date as well as pH/°C chart on every bottle. HI 7004L/C and HI 8004L/C are also supplied with an analysis certificate. NIST Traceability The ingredients of Hanna pH 4 buffers are Potassium Hydrogen Phthalate. They are standardized using a pH meter calibrated by primary standard buffer solutions (NIST 186 Ie, NIST 186 IIe and NIST 185g S.R.M.). The pH value is certified traceable to NIST 185g S.R.M.